The solar system is littered with millions of asteroids, but only a few can be profitably mined for valuable metals and water using current technology. That is the conclusion of a new analysis inspired by the search for life on other planets. 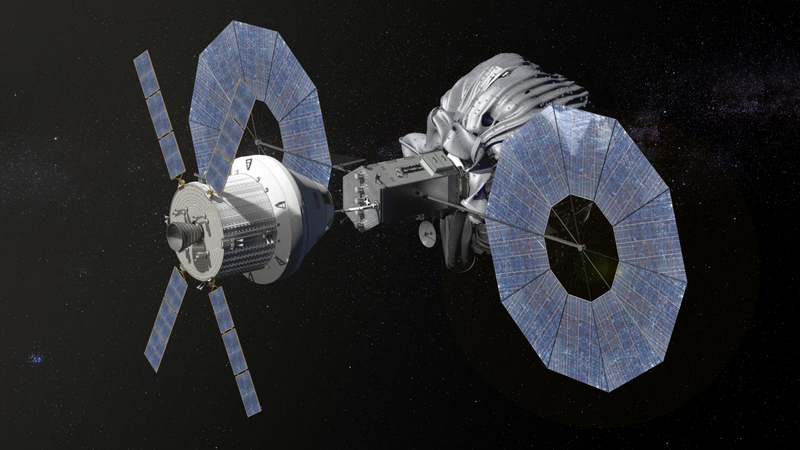 Recent years have seen two US companies – Planetary Resources and Deep Space Industries – established with the intent of one day mining space rocks. NASA also has asteroid ambitions, with a plan to drag one into lunar orbit for astronauts to study. “People tend to lump it all together and say ‘Oh, there’s trillions of dollars of resources up in space’,” says Martin Elvis of the Harvard-Smithsonian Center for Astrophysics in Cambridge, Massachusetts. But it is still unclear which rocks will make the best targets. To tackle the problem, Elvis adapted a tool used to study another cosmic puzzle: the Drake equation, used in the hunt for alien life. Dreamed up in 1961 by astronomer Frank Drake, the equation provides an estimate of the number of detectable alien civilisations in the Milky Way. You just need to plug in realistic guesses for the equation’s various factors. Elvis’s equation – shown above and detailed in an upcoming edition of Planetary and Space Science – works in a similar way. 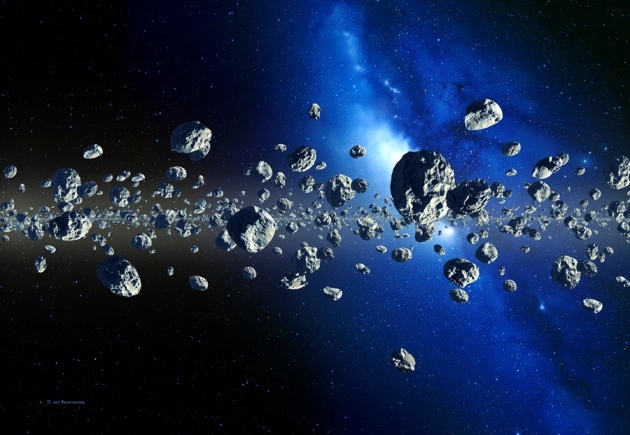 It calculates the number of mineable asteroids for a given resource by combining key factors: the asteroid’s type, its richness in resources, and the practical limitations to mining it. First up is the asteroid’s type, which determines composition. Based on previous surveys, Elvis estimates that 4 per cent of space rocks are the right type to contain platinum and similarly valuable metals. Of these, he says, half will have a rich enough concentration of metal to be worth mining. Of course, companies have to reach an asteroid to mine it. 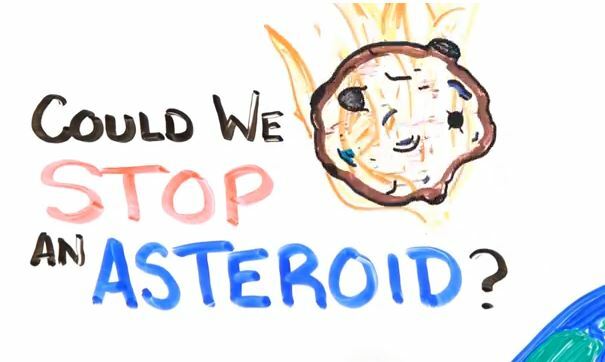 The limiting factor is the energy needed to get to an asteroid with enough mining equipment and return with the mined ore, meaning only 2.5 per cent of asteroids are accessible from Earth. The rock must also be large enough to justify the mining expedition in the first place, so Elvis considers the fraction of asteroids larger than 100 metres in diameter, which if fully mined for platinum would be worth a little over a billion dollars at current market prices. Putting this all together, Elvis says there are only 10 asteroids worth mining for platinum, and 18 for water for future space colonies. Engineering difficulties could make these numbers even lower. Asteroid miners should be cautious in evaluating their plans, Elvis says, as the true value could turn out to be zero. 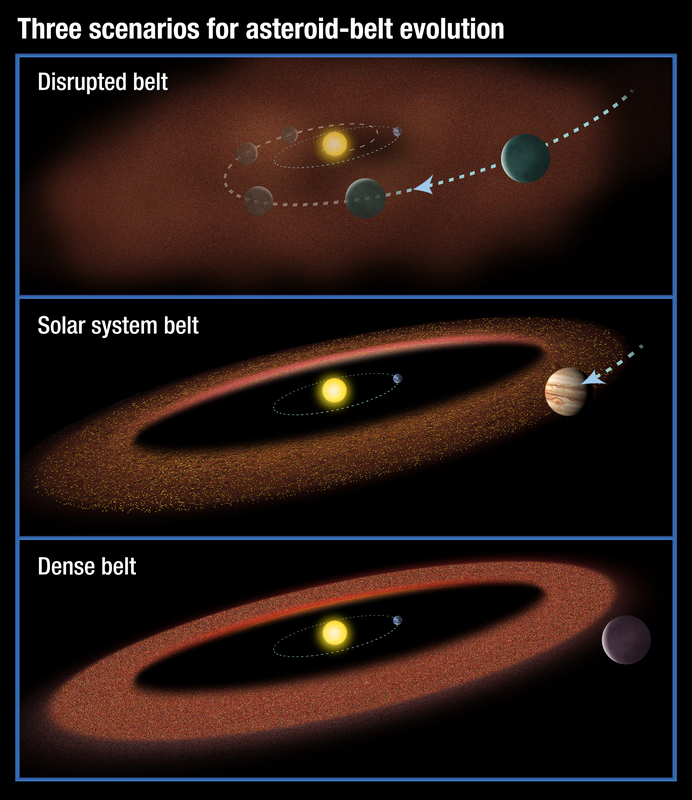 Kuiper belt object challenges planet-formation theories. The Kuiper belt counts at least 70,000 objects with diameters larger than 100 kilometres, orbiting the Sun at least 30 times farther than does the Earth. A planetary scientist has identified the largest-known solid object in the Solar System that could float in a bathtub. The rock-and-ice body, which circles well outside the orbits of the planets, is less dense than water — although a bathtub big enough to hold it would stretch from London to Frankfurt. of smaller KBOs (the more dense solution). Because objects in the Kuiper belt are believed to have changed relatively little since the early years of the Solar System, the region “offers our best chance to comprehend how the early stages of planet formation unfold”, says planetary scientist Andrew Youdin of the University of Colorado Boulder. According to the leading model, small dust particles in the swirling disk that surrounded the infant Sun gradually collided and coalesced to form bigger particles. This process ultimately built dwarf planets in the Kuiper belt, such as Pluto, as well as Earth and the other rocky planets in the inner Solar System. If large bodies in the Kuiper belt were made by the merging of small ones, the densities of the small and big bodies should be related. But objects in the Kuiper belt with diameters of less than 350 km all seem to be less dense than water, whereas those with diameters greater than 800 km seem to be denser than water. The 650-kilometre-wide object 2002 UX25 as seen by the Hubble Space Telescope. One possible explanation for the mismatch is that the smaller objects are more porous, whereas the stronger gravity of the bigger objects packs ice and rock more tightly, creating a denser structure. But for that scenario to hold true, medium-sized bodies — those with diameters of around 600 km — should have a density that is midway between the smaller and larger bodies. That turns out not to be the case if 2002 UX25 — the first intermediate-size Kuiper belt object to have its density measured — is typical of the vast number of similarly sized objects in the belt. On the basis of measurements made with several space- and ground-based telescopes, the object has a density of 0.82 grams per cubic centimetre — 18% lower than that of water. The low density suggests that 2002 UX25 consists mainly of ice, making it difficult to understand how larger, more rocky objects could form from the merging of smaller bodies in the Kuiper belt, notes Brown. But an alternative theory proposed by Youdin and a colleague could explain the results. According to his theory, the large Kuiper belt objects formed first. They were rapidly built from pebble-sized pieces of rock or ice that were forced to clump together by turbulent, swirling eddies in the Sun’s primordial, planet-making disk. Collisions between the large objects chipped away at their icy exteriors, forming the small, low-density Kuiper belt members and leaving behind large, rock-rich bodies. 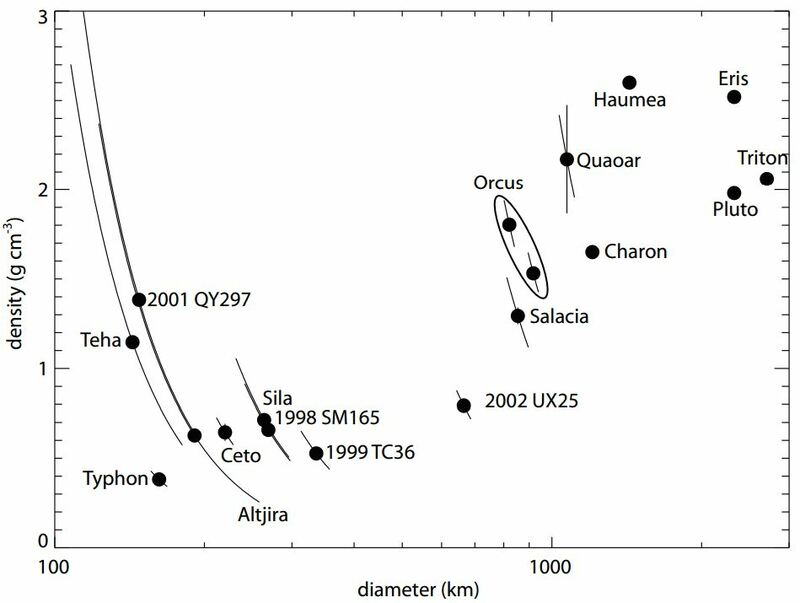 To corroborate that theory, scientists will need to measure the density of more Kuiper belt objects that have a size similar to 2002 UX25, says Youdin. But even if the body turns out to be an oddball, he adds, its extremely low density “can’t be easily dismissed”. 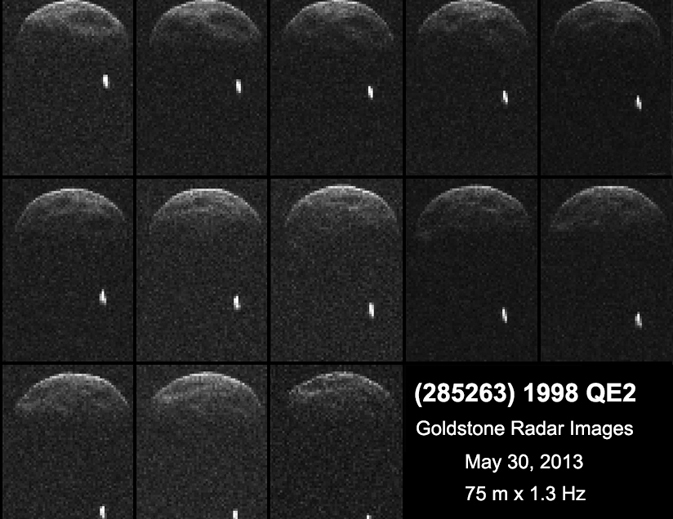 PASADENA, Calif. — A sequence of radar images of asteroid 1998 QE2 was obtained on the evening of May 29, 2013, by NASA scientists using the 230-foot (70-meter) Deep Space Network antenna at Goldstone, Calif., when the asteroid was about 3.75 million miles (6 million kilometers) from Earth, which is 15.6 lunar distances. The radar imagery revealed that 1998 QE2 is a binary asteroid. In the near-Earth population, about 16 percent of asteroids that are about 655 feet (200 meters) or larger are binary or triple systems. Radar images suggest that the main body, or primary, is approximately 1.7 miles (2.7 kilometers) in diameter and has a rotation period of less than four hours. Also revealed in the radar imagery of 1998 QE2 are several dark surface features that suggest large concavities. The preliminary estimate for the size of the asteroid’s satellite, or moon, is approximately 2,000 feet (600 meters) wide. The radar collage covers a little bit more than two hours. The radar observations were led by scientist Marina Brozovic of NASA’s Jet Propulsion Laboratory, Pasadena, Calif. The closest approach of the asteroid occurs on May 31 at 1:59 p.m. Pacific (4:59 p.m. Eastern / 20:59 UTC), when the asteroid will get no closer than about 3.6 million miles (5.8 million kilometers), or about 15 times the distance between Earth and the moon. This is the closest approach the asteroid will make to Earth for at least the next two centuries. Asteroid 1998 QE2 was discovered on Aug. 19, 1998, by the Massachusetts Institute of Technology Lincoln Near Earth Asteroid Research (LINEAR) program near Socorro, N.M. The resolution of these initial images of 1998 QE2 is approximately 250 feet (75 meters) per pixel. Resolution is expected to increase in the coming days as more data become available. Between May 30 and June 9, radar astronomers using NASA’s 230-foot-wide (70 meter) Deep Space Network antenna at Goldstone, Calif., and the Arecibo Observatory in Puerto Rico, will perform an extensive campaign of observations on asteroid 1998 QE2. The two telescopes have complementary imaging capabilities that will enable astronomers to learn as much as possible about the asteroid during its brief visit near Earth. In 2012, the Near-Earth Object budget was increased from $6 million to $20 million. Literally dozens of people are involved with some aspect of near-Earth object research across NASA and its centers. Moreover, there are many more people involved in researching and understanding the nature of asteroids and comets, including those objects that come close to Earth, plus those who are trying to find and track them in the first place. In addition to the resources NASA puts into understanding asteroids, it also partners with other U.S. government agencies, university-based astronomers, and space science institutes across the country that are working to track and better understand these objects, often with grants, interagency transfers and other contracts from NASA. NASA’s Near-Earth Object Program at NASA Headquarters, Washington, manages and funds the search, study, and monitoring of asteroids and comets whose orbits periodically bring them close to Earth. JPL manages the Near-Earth Object Program Office for NASA’s Science Mission Directorate in Washington. JPL is a division of the California Institute of Technology in Pasadena. In 2016, NASA will launch a robotic probe to one of the most potentially hazardous of the known Near-Earth Objects. The OSIRIS-REx mission to asteroid (101955) Bennu will be a pathfinder for future spacecraft designed to perform reconnaissance on any newly-discovered threatening objects. Aside from monitoring potential threats, the study of asteroids and comets enables a valuable opportunity to learn more about the origins of our solar system, the source of water on Earth, and even the origin of organic molecules that lead to the development of life. 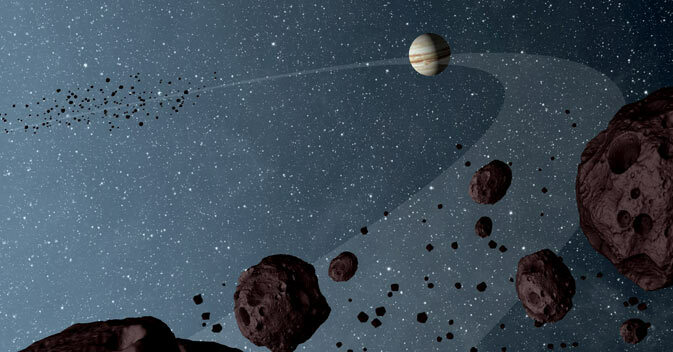 Other planets were later found to have Trojan asteroids riding along with them too, such as Mars, Neptune and even Earth, where WISE recently found the first known Earth Trojan: http://www.jpl.nasa.gov/news/news.php?release=2011-230 . Enter WISE, which roared into orbit on Dec. 14, 2009. The spacecraft’s 16-inch (40-centimeter) telescope and infrared cameras scoured the entire sky looking for the glow of celestial heat sources. From January 2010 to February 2011, about 7,500 images were taken every day. The NEOWISE project used the data to catalogue more than 158,000 asteroids and comets throughout the solar system. The results were presented today at the 44th annual meeting of the Division for Planetary Sciences of the American Astronomical Society in Reno, Nev. Two studies detailing this research are accepted for publication in the Astrophysical Journal.